2:45 p.m. – The Steelers have begun making their way onto the field. They are still not allowed to wear pads. Some of the first guys out here are Heath Miller and Byron Leftwich. They’ll be practicing on the far soccer field today because the normal ones are very wet from yesterday’s storms. 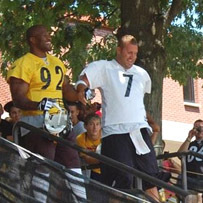 The biggest cheer from the crowd came when Ben Roethlisberger and James Harrison walked down the steps HOLDING HANDS! It may be the heat, but the crowd is extremely small for the first Saturday of camp. WPXI does a great job of taking you through the whole practice day here. You can check out a larger version of the photo above on WPXI’s slideshow here.